It's been a long time coming for an update to my site. If you'd like to visit my original one, here's a link. European Triode Festival 2006 at Biezenmortel, Netherlands. European Triode Festival 2007 at Biezenmoretl, Netherlands. information about it and the other amps I've built. Just scroll on down and click the picture that interests you. If you're interested in an amp you see here, I do build custom amps on a per-order basis. Just drop me an email. THIS SITE IS AT YOUR OWN RISK. BE CAREFUL AND DON'T KILL YOURSELF. HELP OF SOMEONE WHO IS. That being said, have fun. My first DIY amp, a SE Type 45. Crude compared to my current work, but this is where I started. very efficient speakers and play with plenty of volume with only 1.5 watts. conservatively. My aesthic ideas were inspired by the McIntosh amps I have and I appreciate the McIntosh build quality. area and now it lives on the east coast. I built another one of these amps which is still in use by a friend in Fort Worth, Texas. here is my first stab at a 300B amp. on the WE91A circuit as my favorite. My friend, Ray Gallagher, owned a 2A3 amp like the one you see above, and when he heard the 300B, he had to have one. This is the one I built for him. This amp was built almost 5 years ago and has had heavy use without a failure (except for the driver tubes). with very good results. I've been collecting them for some time and I have a good stock on hand. after a little discussion, we decided on a white finish. I think it's a very distinctive style, very clean-looking. vintage jazz recordings when he visited me. He very much wanted an amp of his own, so I built him this one. do any meaningful comparisons, but from what I've seen published on the web, the James iron is very good. This is the first amp I built using the James iron and it's the one I listen to every day in my own home. Here's my second European amp, built for Wouter Vriesman who lives near Amsterdam. Here's a link to my monster project, the SE845. It's still a work in progress. 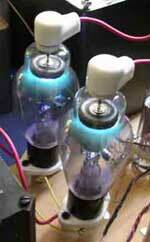 Here's a link to an amp I built using Type 47 pentodes. Unlike my usual designs. Here's a link to an amp I built in May of 2007 for Hal Hudgins of Tyler, Texas. Here's a link to an amp I built in August of 2007 for Larry Terry. There's more to come in the near future, so check back again. I welcome email from tube hobbyists. © Raymond Koonce 1998-2007 all rights reserved.